Adjust transition settings via transition effect, duration, etc. Customize DVD menu for DVD conversion. What do you know about slideshow transitions? Actually, they are an interesting subject in the world of presentation. If you create a slideshow with transitions, it makes the presentation more interesting and engaging. The use of subtle effects does a lot to add style and panache to an otherwise dull presentation. Hence, this acts as a reason to attract viewers even on a dull subject but delightful visual effects. Also, it is important to note that if transitions are used properly, they can bring much variety to a slideshow. However, you have to be careful when creating special transition effects for the slideshow to avoid distracting your audience. So, to learn how to apply these slideshows transitions effect, following guide will assist you a lot. The main process starts with using the best transition effect creator. 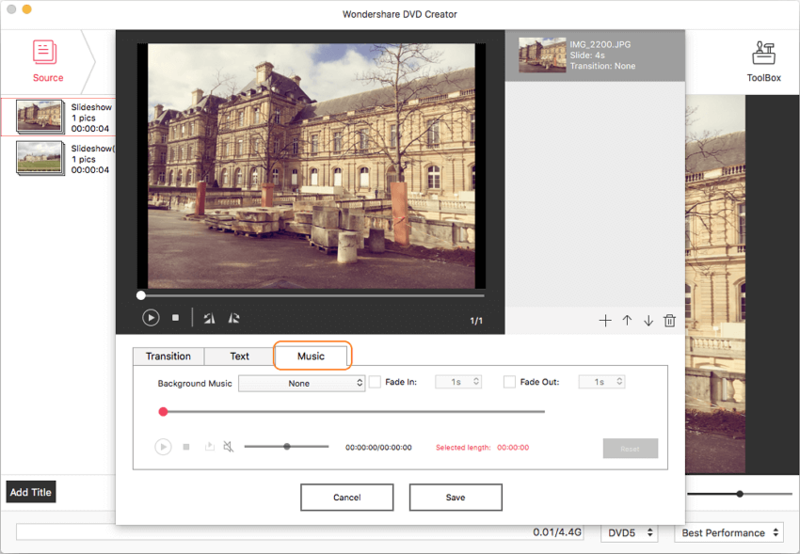 So, here we are going to let you know how you can perform the task of adding transition effects using the software called Wondershare DVD Creator with a detailed guide. 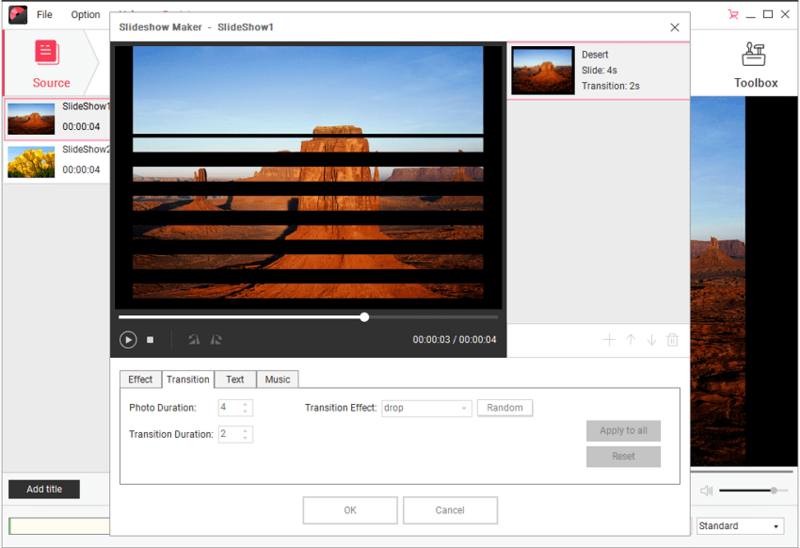 It's a professional slideshow creator which can help you create photo slideshow with transition effects and burn to Blu-ray disc so that you can play it on TV or other playable devices. 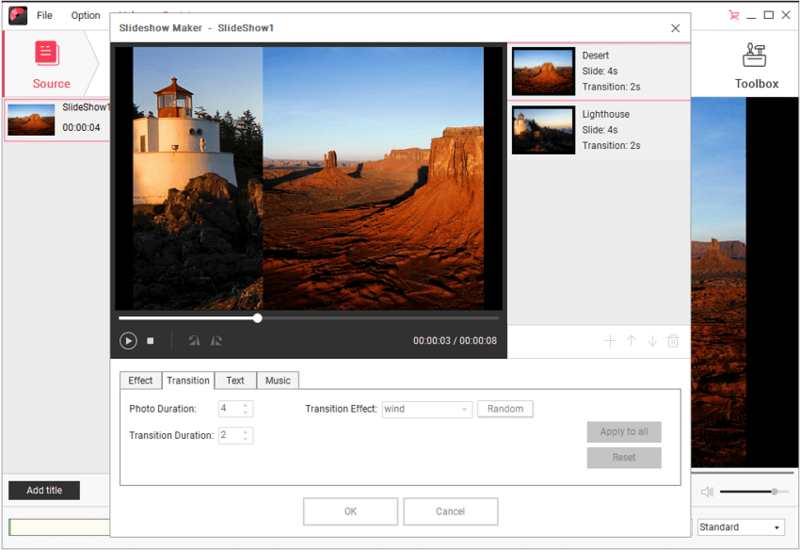 With Wondershare DVD Creator, you can make more customization such as create a disc menu, add effects and watermarks to your slideshow disc, edit subtitle and background music, and others. Let's start adding transition effects to your slideshow and burning it to Blu-ray disc using Wondershare DVD Creator. Burn pictures and videos in any format to DVD/Blu-ray/BDMV/ISO file. 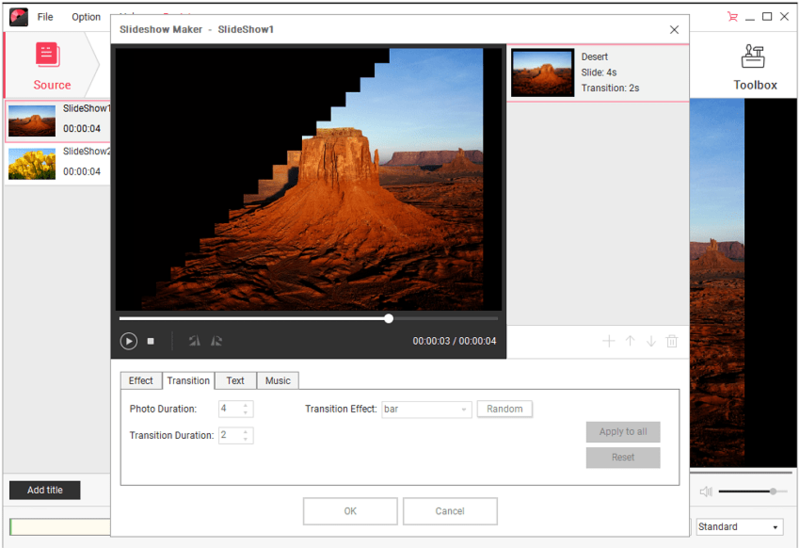 Edit photos by applying transition effect, adjust photo/transition duration, etc. 100+ free static and dynamic DVD templates from Sports, Movie to Family life theme. 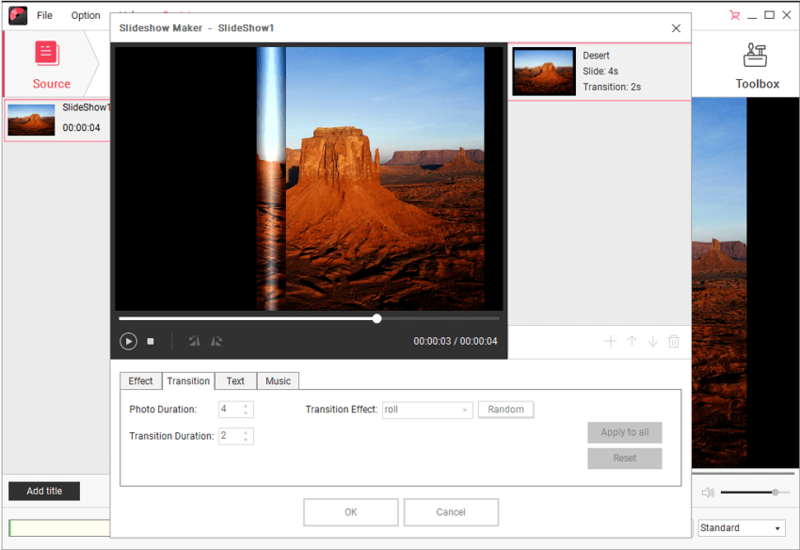 Customize DVD menu by changing background image, adding title, editing thumbnail, creating chapters and more. Create photo slideshow to DVD with a fast burning speed and high-quality output. Additional toolbox with functions of Data Disc, ISO to DVD, One-click to Burn Blu-ray Disc, Blu-ray Disc to Video, etc. 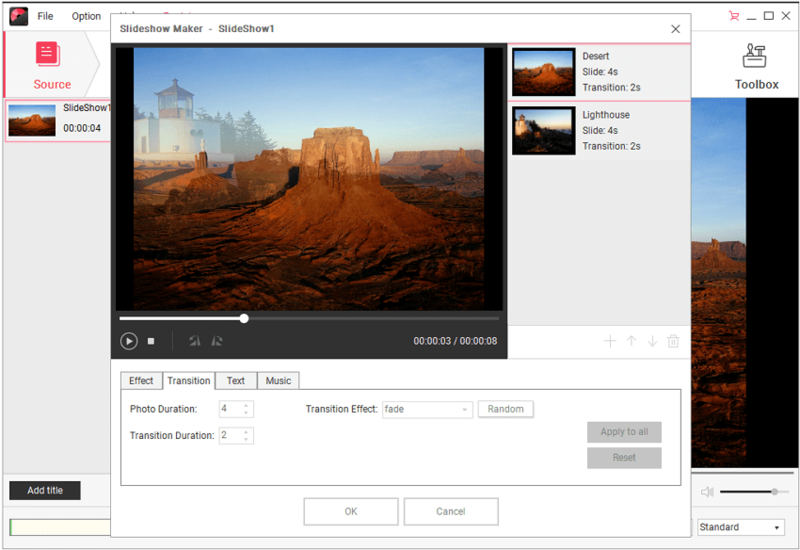 Wondershare DVD Creator allows you to add transition effects to DVD. You can download the program via the download button above first. Open it after installation, and choose Create a New Project on the initial interface. After opening the program and selecting the disc type, you can now start adding photos. There are two methods: Click on the + icon to open a dialog box to upload pictures or drag and drop the images directly into the screen. All added files will be displayed as thumbnail at the left panel, click the pencil-like icon on the thumbnail to open the new photo edit window. On the pop-up window, click the Music button to add background music to your photo slideshow. Click the Save button to confirm your changes on the music length and playback effects. You can also add text for your photo slideshow by moving to the Text tab. Click on the Transition tab to create the slideshow with transitions. Choose from over 10 different transition effects like Iris, Wipe, Light, and others. You can even modify photo and transition duration. Click on the Preview tab to get an idea of how the slideshow transition effects will work. If you are not happy with what you see, click on the relevant tabs to make adjustments. Once you are done, move to the Burn tab and choose Burn to Disc option. Finish Burn Settings it shows and click Burn button to start burning your photo slideshow. 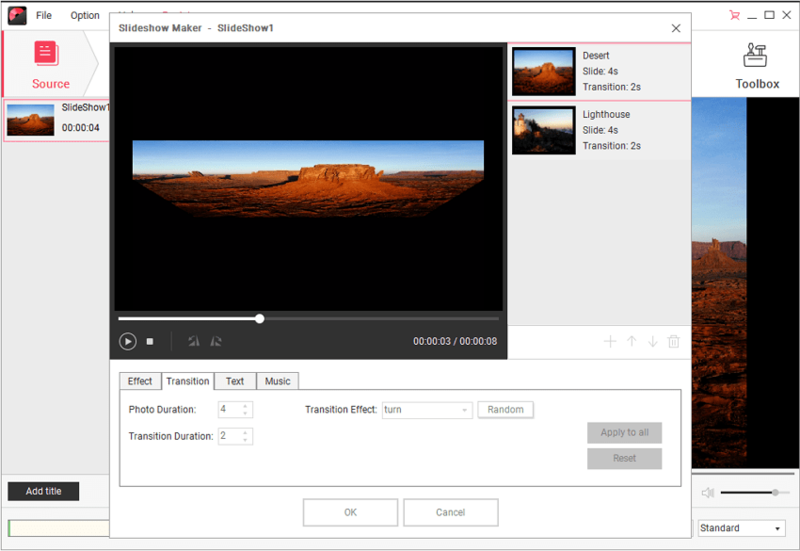 Wondershare DVD Creator lets users add as many as ten different effects in their slideshow transitions. These effects can be fixed to one style or it can be randomized. The effects are rich in variety and simple in execution. Slideshow transitions are ideal for indicating a change in slides. So, without delaying any more we are going to delve to learn more about various transition effect, let’s have a look at them one by one. Bar starts at top-left and ends at bottom-right, the transition consists of several rectangle-shaped bars moving from one side to another, signaling a change in the slide. The Drop is an interesting transition effect where the slide breaks into several pieces. The pieces slide down to reveal the next picture in the slide. Erase is a simple effect where the image will swipe from left to right. It is a great choice for a simple but effective transition. As the name implies, the image will just fade away and the next one will appear. It is a smooth transition and excellent for an image slideshow. The merge effect sees the new slide emerge from the left and right side of the screen to converge at the center. One of the best slideshow transition effects because of its simple, seamless transitions. Roll is a very animated and sophisticated transition. The corner of the slide will ‘roll up’ like someone rolling up a piece of paper and roll out revealing the next slide. It is visually impressive and satisfying. A unique transition effect you will not find anywhere else, skew starts at the center and starts to ‘tear’ apart until the new slide is revealed. True to its namesake, this effect sees the slide flip over and around revealing the next slide. Wave is a transition effect guaranteed to catch the eye. It starts as a slow wave that spreads to all ends of the image. As the wave spreads the next image in the slide appears as the previous one disappears. The wind effect sees the slideshow transfer from one slide to another very quickly. The slide is essentially ‘pushed out’ as if a gust of wind blew it away, in favor of the brand new slide. Transitions are an excellent effect to make the slideshow look active and dynamic. 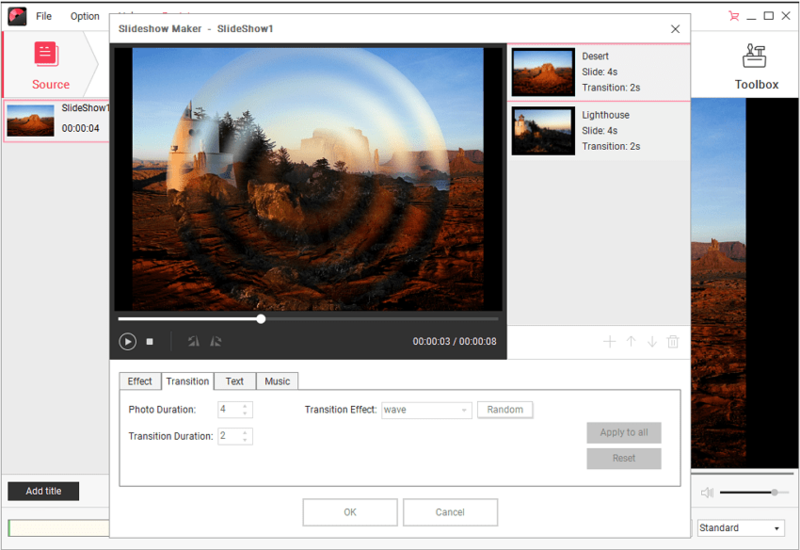 The top 10 slideshow effects are the most common effects in Wondershare DVD Creator. They are chosen because they are easily accessible to anyone (including those with the free trial). The effects can then be customized to suit your needs. You can have the slideshow transition effect randomized or stick to one effect. However, those who are looking for something a bit more sophisticated can get it in the form of flash transition effects. Flash transition effects are found at the Wondershare Flash Gallery Factory. The Gallery contains several effects which can be combined to create several spectacular effects like flash fade effect, flash splash transition and 3D title transitions. The flash animations are pre-made which makes it very simple to work with. Even if you are a beginner, you will be able to create sophisticated animations through the Gallery. Avoid using too many photo image transition effects in a single slideshow. Having several random effects with no thematic connection makes you look like a newcomer who was playing around with slideshow techniques. Restrain the number of transition effects to just one or two per slideshow presentation. When you have a limited number of effects, the audience becomes accustomed to seeing the same animation over and over again. When they become used to the effect they are no longer distracted and focus on the slideshow. 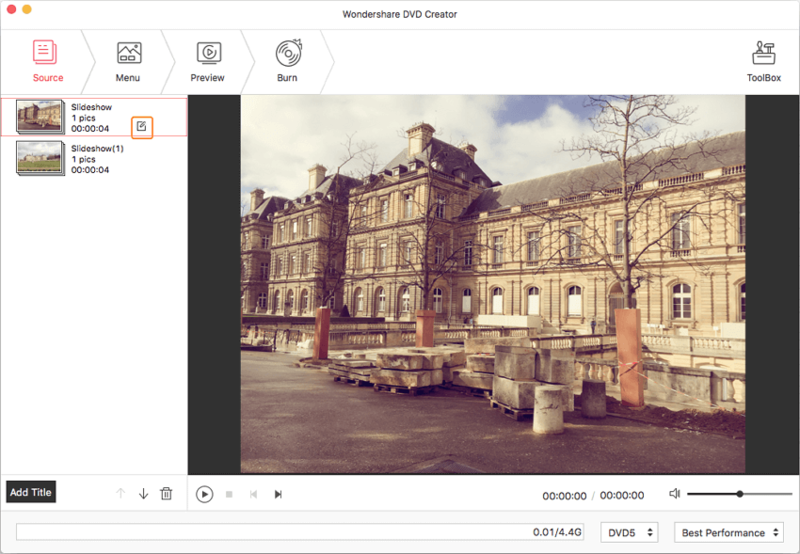 Wondershare DVD Creator is an excellent tool to create DVD slideshows using images and videos. If you are interested in trying the product for yourself then consider downloading a free trial of the software. You can find the free demo at the official website. You can also visit the website to learn more about slideshow transition effects.